Your physical therapist in Glendale and/or Scottsdale will perform a clinical evaluation to determine both the source and the cause of your symptoms. 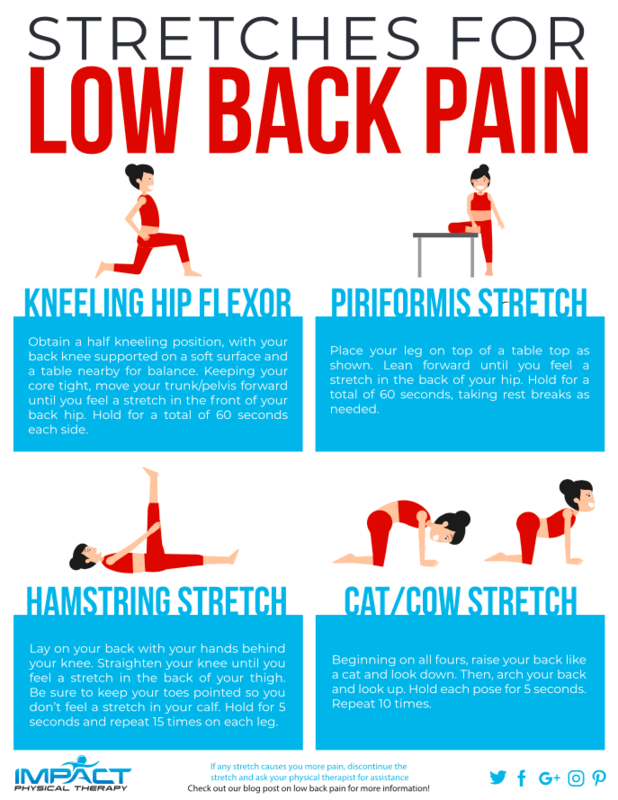 Below is a list of stretches that might assist you in relieving your low back pain while you await your appointment. Feel free to also review these strengthening exercises for low back pain along with some surprising contributions to low back pain you might not be aware of. Obtain a half kneeling position, with your back knee supported on a soft surface and a table nearby for balance. Keeping your core tight, move your trunk/pelvis forward until you feel a stretch in the front of your back hip. Hold for a total of 60 seconds each side. Place your leg on top of a table as shown. Lean forward until you feel a stretch in the back of your hip. Hold for a total of 60 seconds, taking rest breaks as needed. Lay on your back with your hands behind your knee. Straighten your knee until you feel a stretch in the back of your thigh. Be sure to keep your toes pointed so you don’t feel a stretch in your calf. Hold for 5 seconds and repeat 15 times on each leg. Beginning on all fours, raise your back like a cat and look down. Then, arch your back and look up. Hold each pose for 5 seconds. Repeat 10 times. If any stretch causes you more pain, discontinue the stretch and ask your physical therapist for assistance. Follow this helpful guide to better your technique and understanding of proper stretches.